Whether you’re a first-timer or a seasoned veteran, the following tips will help make your Today’s Bride Show experience both productive and enjoyable. how can I prepare for a today’s bride show? Look through our exhibitor list and review the vendor profile pages of any vendors you’re still looking to hire. Click through photos, compare services and highlights, visit their social media pages, and make a list of who to search out when you visit the show. Establish your wedding budget ahead of time. Make a list of what you need the most and what portion of your budget you wish to allocate to each service/product. Create a wedding email. Wedding emails are a fantastic way to keep yourself organized throughout the planning process! Instead of unsubscribing from dozens of emails after you’re already married, you can simply delete the account! Pick up any information available. Take some time to look over what you’ve collected once you get home. Make notes on the literature at the show while it’s fresh in your mind. Be prepared to make decisions and put deposits down on services. Wedding dates fill up quickly once an exhibitor participates in a bridal show. If you know you definitely want to book with a service provider at a show, they’ll probably require a deposit to hold your date. Each exhibitor will have its own requirements for payment be it cash, check or credit cards. Read contracts carefully and inquire about refund policies before giving any money. Arrive early regardless of which fashion show time you choose; we recommend arriving approximately 1 to 1-1/2 hours before the fashion show. Seating is typically first come, first serve. A notebook and pen are key. You’ll be surrounded by information, inspiration, and trends. Having a notepad at your disposal to write down ideas, trends you love, names of your favorite companies, or even the designer of a dress you love on the runway will keep your mind clear to absorb even more wedding goodness! Bring color swatches, ribbon in the colors of your wedding, fabric swatches, and even photos of your dream wedding gown. This will assist bridal shops, bakeries, florists, & many other professionals in generating ideas to complement your wedding theme. Bring printed address labels. To avoid having to write your name, address, phone number, and wedding date 50 times, consider bringing some address labels with all the information on it or make up your own computer labels that include your phone number. If you do print your name on entry forms, make sure you write neatly and legibly. Bring a calendar or date book to help you schedule appointments with potential service providers after the show. Bring your wedding binder or folder. We provide brides with a pink, Today’s Bride tote bag (as long as supplies last), but you might want a folder or binder to organize all the information you’re receiving! If you can’t attend personally, send your mom or a friend to pick up information for you. You may even still qualify for prizes at some of the shows. Grooms-to-be are always welcome! Bridal shows are not just for brides, there are plenty of wedding plans that may require the groom’s input. We welcome children, and children 6 and under get in free! Because we suggest scheduling at least half a day for our shows, we do advise against bringing children because they tire easily. If you do decide to bring a little one along, keep in mind that strollers are hard to maneuver around the booths, displays, and the other guests. 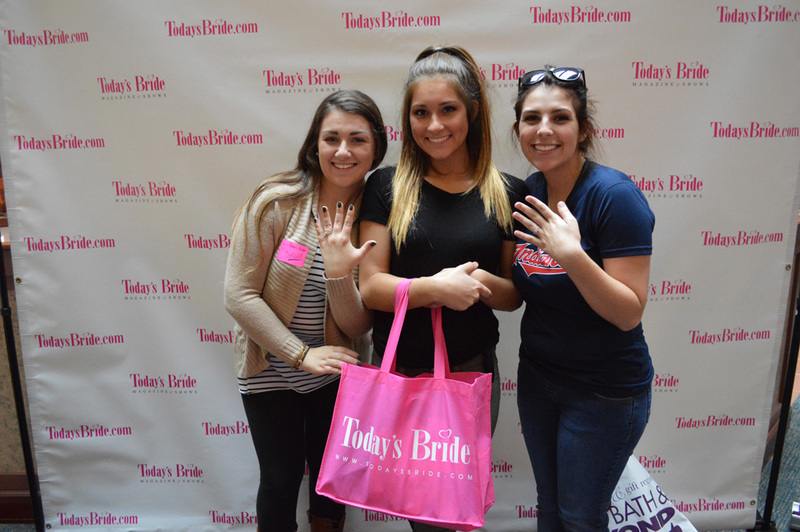 The most important thing about attending a Today’s Bride Show is to ask questions! The vendors are there to help you. You are under no pressure to buy from them, so find out everything you need to know. Every bride who attends the show will receive the latest copy of our Today’s Bride Magazine! Refer to this planner when you’re talking to vendors, as it has every question you need to know before hiring their services.